Railpictures.ca - Rob Smith Photo: CN 435 with recently repainted CN 8103 leading, passes RLHH 3403 working Brantford Yard. The RLHH was backing up at the time, so the timing worked out pretty good. Thanks for the heads up James, it was a good thing we crossed paths this afternoon. | Railpictures.ca – Canadian Railway Photography – photographie ferroviaire Canadienne. 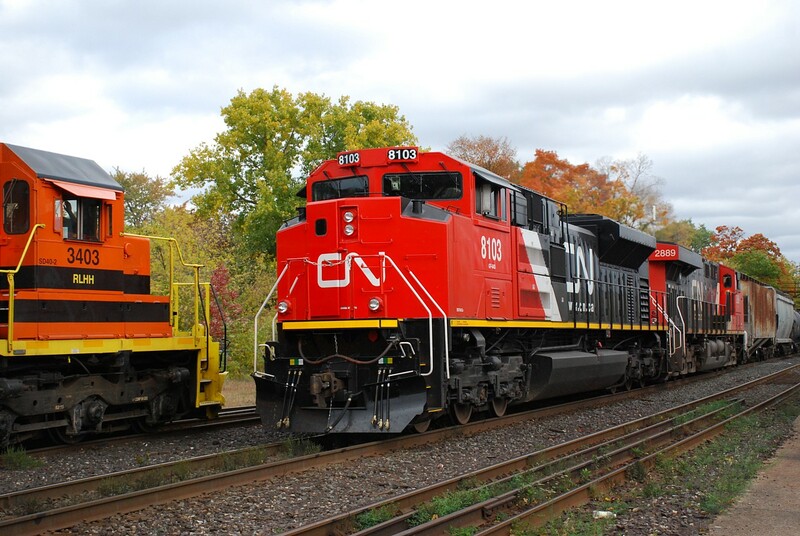 Caption: CN 435 with recently repainted CN 8103 leading, passes RLHH 3403 working Brantford Yard. The RLHH was backing up at the time, so the timing worked out pretty good. Thanks for the heads up James, it was a good thing we crossed paths this afternoon. He’s saying he likes the 8103 vs. all the GE’s… and I agree! I like it, can’t say the same for all the GE’s though. Well, maybe a few. That is one ugly unit, lol.